We all have a pretty good idea of when an inpatient adult trauma patient is getting into trouble. Most rapid response teams have a set of criteria that are used by nursing personnel to initiate an RRT response. However, children who are beginning to decompensate can show it in more subtle ways. Fortunately, there is a tool that can be used to identify children who are showing early signs of developing problems. 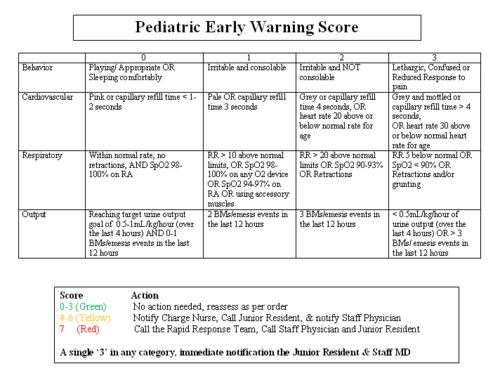 The Pediatric Early Warning Signs tool (PEWS) is an objective system for assessing the potential for deterioration in a child. It can be customized based on institutional needs, and typically has behavioral, cardiovascular, and respiratory components. At our pediatric trauma center, we added a urinary output component as well. Scoring for each component ranges from 0 (best) to 3 (worst). The total score is calculated, and is used to classify the child as green (benign) to red (immediate action needed). Again, these thresholds can be adjusted by each hospital. At our center, nursing calculates the PEWS score every 4 hours on non-ventilated patients. We implemented this system earlier this month and will be validating it during the coming year. Our hope is that it will reduce the number of RRT and code calls by identify deterioration at a much earlier stage. You can download a copy of our PEWS instrument here. Thanks to Tracy Larsen RN, our pediatric Trauma Program Manager, for providing information on this system.